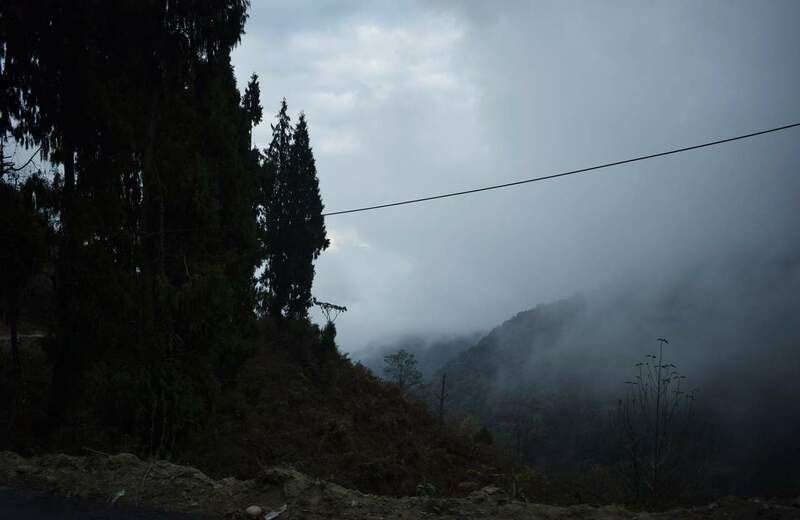 Arunachal Pradesh is nothing like what you have seen till date. And do not get me wrong there. It is better that you have not seen it yet. Life deserves occasional surprises to fight the routine. Also, life needs to be assured it shall be punctuated with simple pleasures way bigger than the regular holiday destinations up in the mountains, in the Himalayan terrain. When the good old Himachal and Nainital starts to wean out from your ‘oh yes, lets start tomorrow’ list, Arunachal Pradesh chuckles! Arunachal Pradesh remains as one of India’s least explored states. If the political and climatic hindrances were not enough, take account of the steep Himalayan ranges protecting one of the incredibly bio diverse ecosystem on earth. 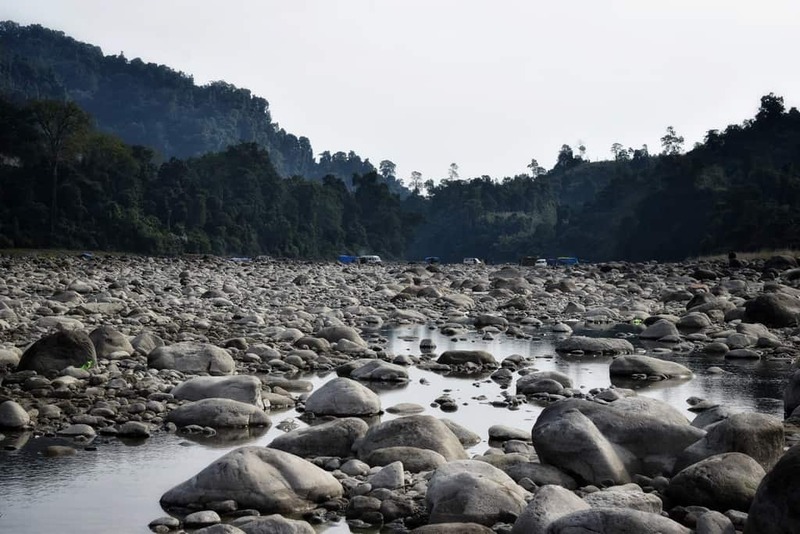 Few forest regions have been protected as national parks and been open to discerning travelers (yes Pakke and Nampada, I am talking about you two!). However the state at large remains in a realm of mystery. Wildlife thrives in unknown valleys, ice cold streams, glaciers, and other places where sun rays kiss the first in India! Yet, they remain no man’s land. An imaginary border between hostile neighbors have caused sparks of tensions, made people stand in incredibly punishing snow for decades(this discussion shall wait), claimed precious lives and rendered vast regions as no man’s land! Orchids bloom, “naam na jana” birds chirp, rivers like Jia Bharali flirt and the last lap of somber Himalaya meditates. 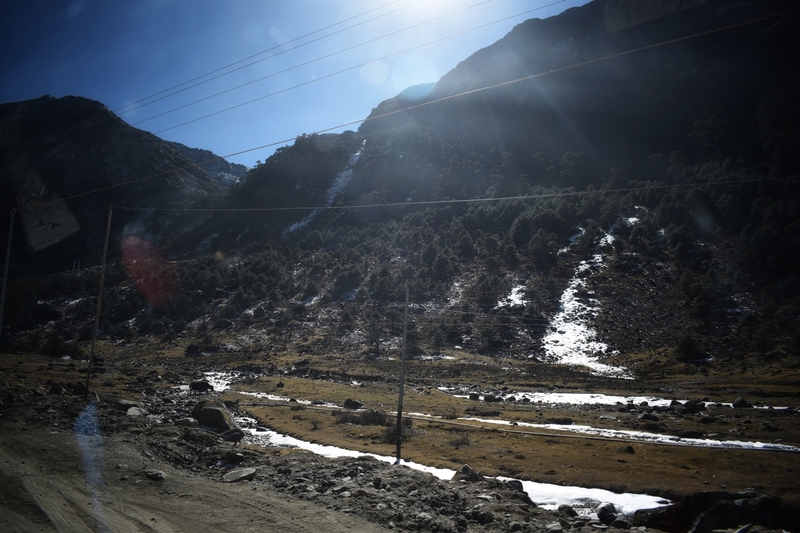 Information boom has not milked much from the wilderness that Arunachal Pradesh is. 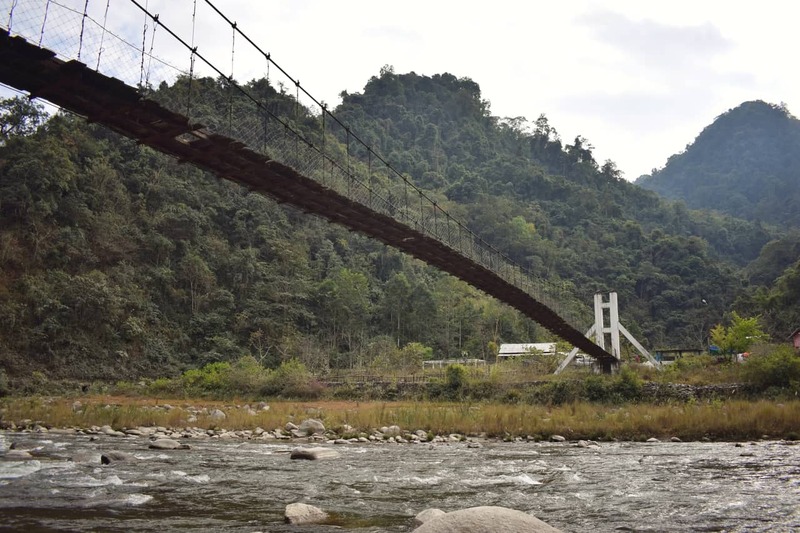 And, as the infrequent backpackers will take yet another attempt to experience the last bit of pristine Himalayan mountain, let me share my two cents on the destination of Arunachal Pradesh! So what high school Indian modern history has little to do with (or at least had little when I was in school)the state, the Veda Vyasa had christened them as Prabhu mountains. It is also said Sri Krishna tied the nuptial knots with Rukmini in one of the lush valleys. Dirang, was it? Amid the vivid blooms of myriad orchids? Entering Arunachal Pradesh: how to procure ILP and PAP for Indian and foreign nationals! What the other nations call as Visa, Arunachal Pradesh calls that ILP (Inner Line Permit) for mainland Indians. Without the stamped document, you can not tread a single step in the border. be cognizant of the fact and try procure one for yourself. Arunachal Pradesh has designed an easier way to get the visa through online application. Do check that site. This will require you to fill up the necessary information starting from your DOB to your Grandpa’s DOB (just kidding) but you know security is a big pain when you have got hostile neighbors! Be prepared with a couple of passport photos. Make sure your ear lobes are visible when you sign up for the photo shoot! River Jia Bharali, also known as Kameng to the loacls. Somewhere in Bhalukpong. 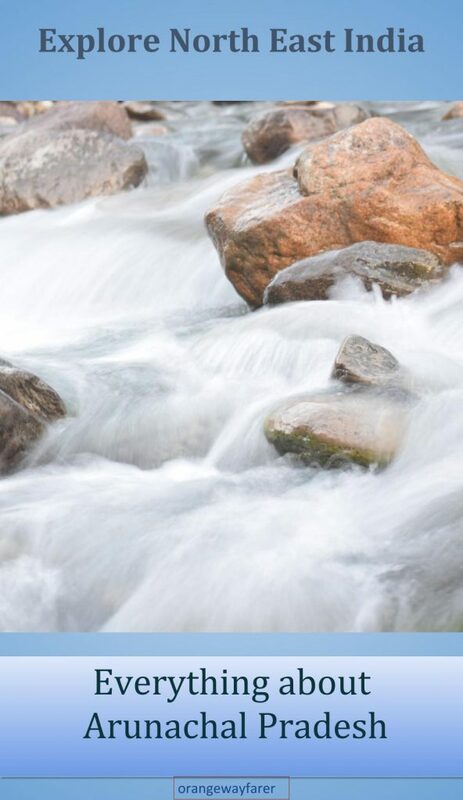 This river will take the stress out of your mind.. all the hassles of getting the permit! For Indians: With an ILP, you can pretty much access all the permittable routes in Arunachal Pradesh. I mean the 11/ 12 odd routes. Tawang, Mechuka, Zero, Along being the more prominent of the lot! Trust the old school route map because google map fails often. A local reference. Now this is tricky right? Agreed we all came from the same keen from an ancient land thousands of years ago, but may be you and the keen from Arunachal Pradesh, India are not exactly in a conversing mode? Worry not, contact your homestay owner. Unless you produce a local reference, chances are high your ILP will never see reality! It will take a few hundred rupees and a day’s time if you are applying online, However, if you are still not convinced of online method, and want to go old school with a paper and stamp, good luck! 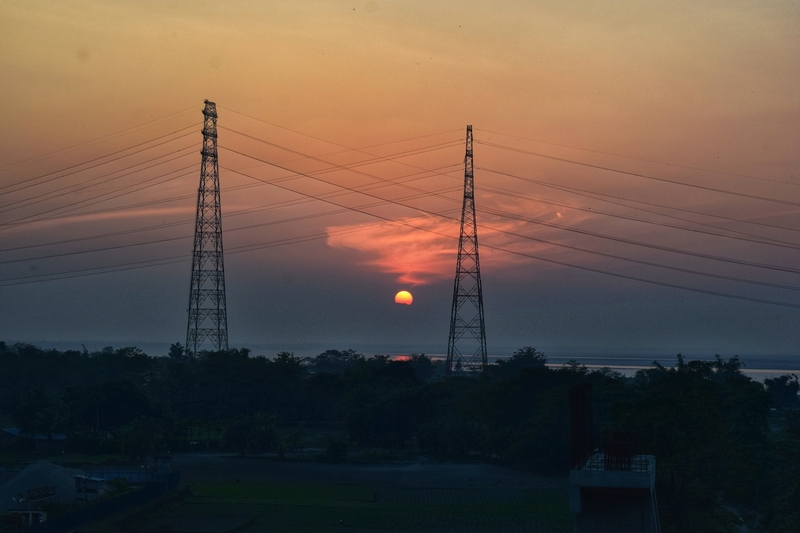 If it is early in the morning, you can procure one ILP from the Guwahati airport. If you are reaching Bhalukpong and want to get it from there, you better reach in the first half of the day. The border of Assam and Arunachal can only be crossed with an ILP. Here is the website to apply for ILP. For Foreigners: Your access may be barred if you try to get too close to the border. 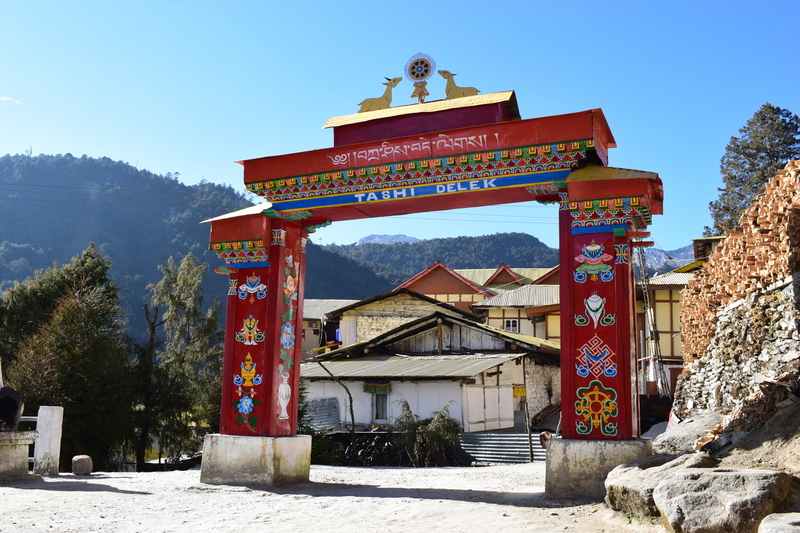 For example, Tawang will welcome you as long as you explore the city of Dalai Lama and the large monastery. However, the moment you want to tread on the path of Bumla Pass, you will be questioned, stopped (politely) by one of the army men! I guess the feeling is mutual if not stricter on the other side of the border. We could spot not a single soul near Bumla except for a single concrete check post and a serpentine road spiraling towards erstwhile Tibet. 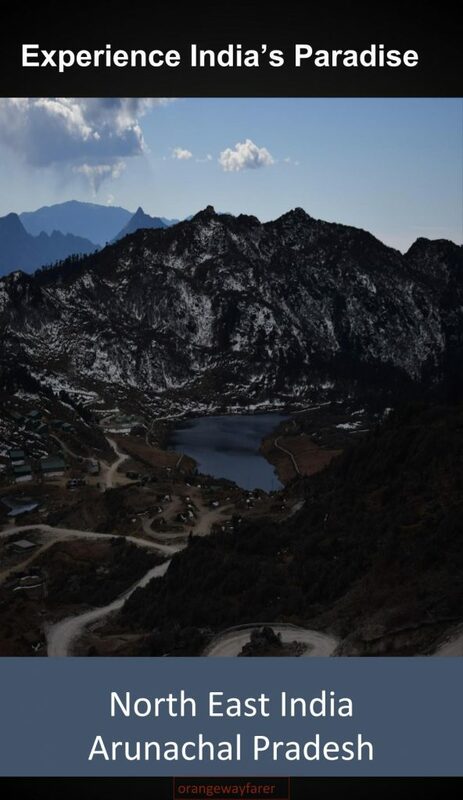 However, that must not stop you from exploring the paradise of Arunachal Pradesh, also known as Switzerland of India! PAP: What you shall call the permit is PAP. Protected Area Permit. India and China, for long, has showed off muscle power throughout the border. Result? Your entry will face certain hurdles. You will also be required to produce the permit multiple times at check point. there is no other way to explore Arunachal but to abide by the governance rules. Lets get to see how to work around the same. If you have got an E-Visa, chances are slim you wil get a PAP. 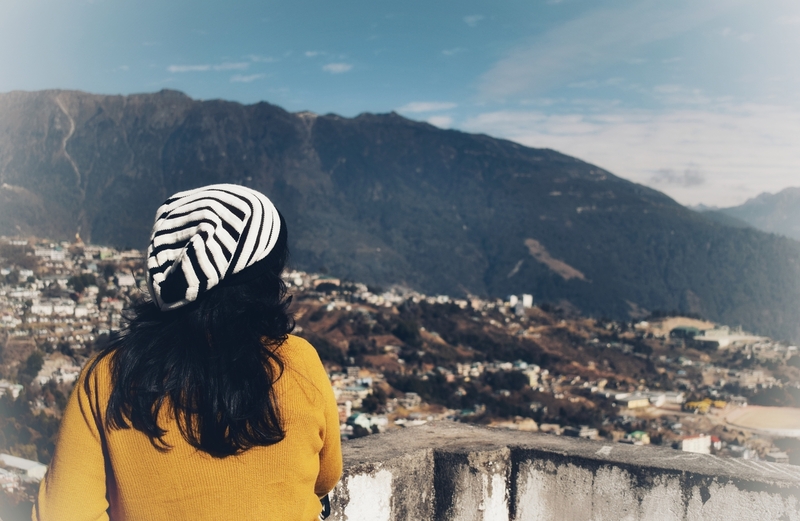 To get a PAP (even if you are travelling with an Indian national), you need to head straight to the Deputy Resident Commissioner Office of Arunachal Pradesh. A simple google map search will bring you to the place that is in Guwahati, Assam. Ditch the agency or tour companies though they do a fair job with a few thousand INR extra. If you apply in the morning, you are likely to receive it back in the evening, same day. Calm down, your passport shall not get any extra stamp that China may frown upon in future! River Bramhaputra is a Nod and not a Nodi, the feminine river. Much like nile. 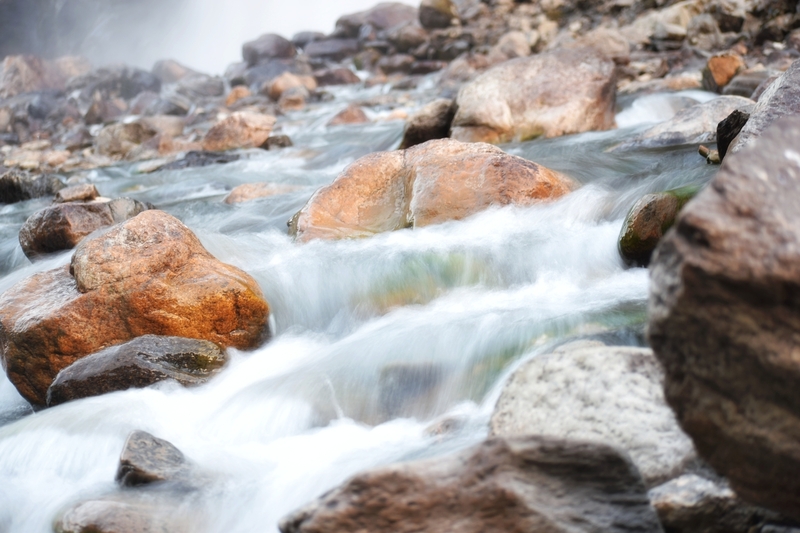 Named after one prime God of Hindu Trinity, this river is endless and astounding! All the Su (local dialect for a river) you will see in Arunachal flows down the mountains and come, meet him! Compare with the azure beaches of Goa. What are the major destinations in Arunachal Pradesh? There are about 12 routes through which a travelers can explore destinations of Arunachal Pradesh. Simplified word would be like outsiders are allowed and not glanced with suspension if found on those tourist trails with proper documents. Choose your route after research. Consider the time you are visiting, the amount of snow and road blocks and related logistic issue. I also recommend exploring the Meerthang glacier if adventure is your thing! Basic Mountaineering course conducted by NIMAS (National Institute of Mountaineering and Allied Sports), Arunachal will help you trek it. There, I have successfully confused you! And, also have probably made you a little greedy! Have a look at the map and know this is the largest state of the seven sisters region, often with least infrastructure and mostly remote. Choose your destinations wisely! 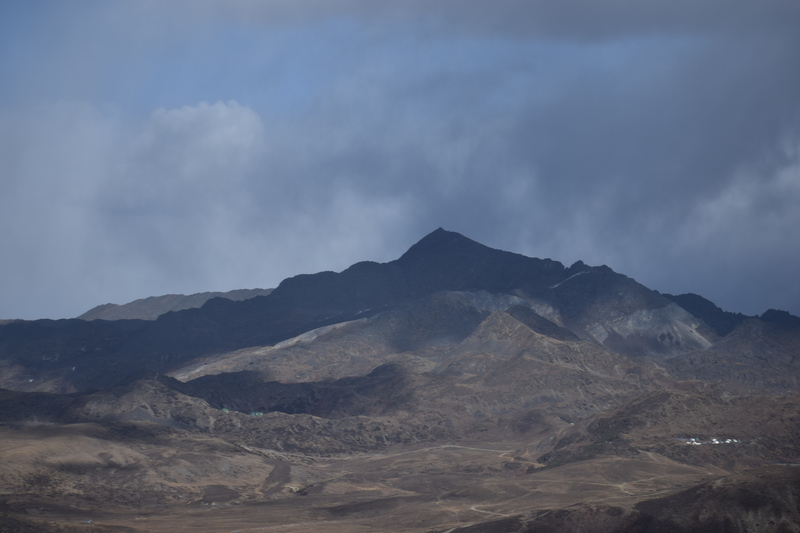 Arunachal Pradesh was also known as South Tibet to the Chinese! Into the wild, clouds come down to kiss the wayfarer! 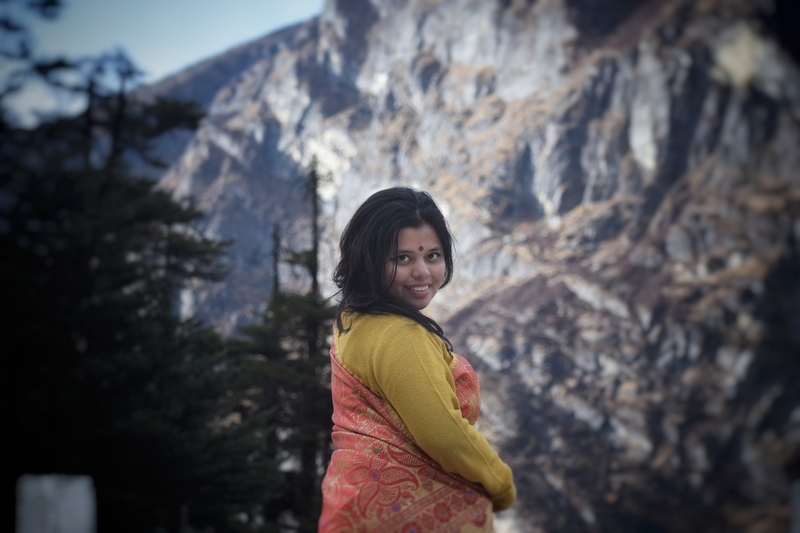 Explore the beauty of North East India! When is the best time to visit Arunachal Pradesh? Weather shows the superlatives of cold in higher altitude regions. There may be time a route is closed for excessive snow fall. Whenever you plan, make an account for that. The monsoon pouring have always caused flooding in Bramhaputra and helped attain the apparently simpleton mountain streams monstrous volumes. Account for that as well. While travelers brave all the seasons and explore Arunachal Pradesh’s nature, I recommend learn about weather forecast before planning. 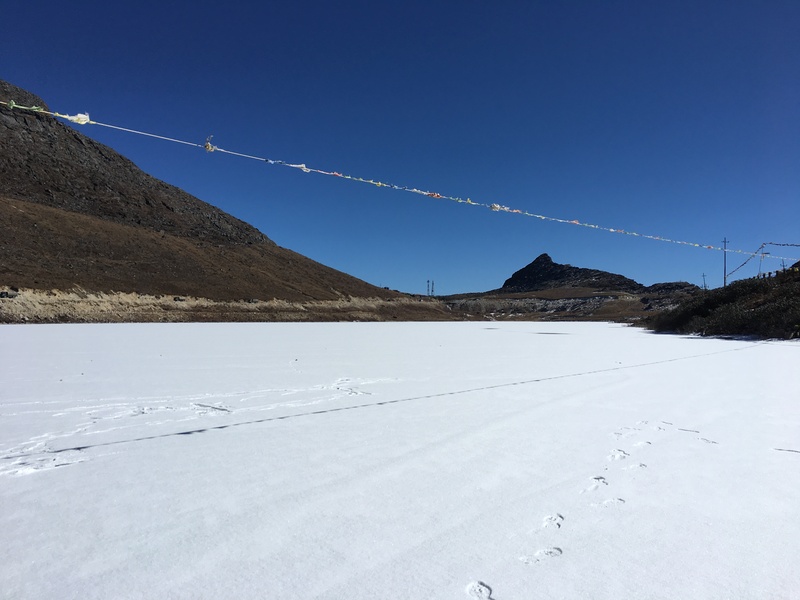 The Sela Pass, mostly covered with snow at any point of time. Also known as the highest motor-able pass of the world! 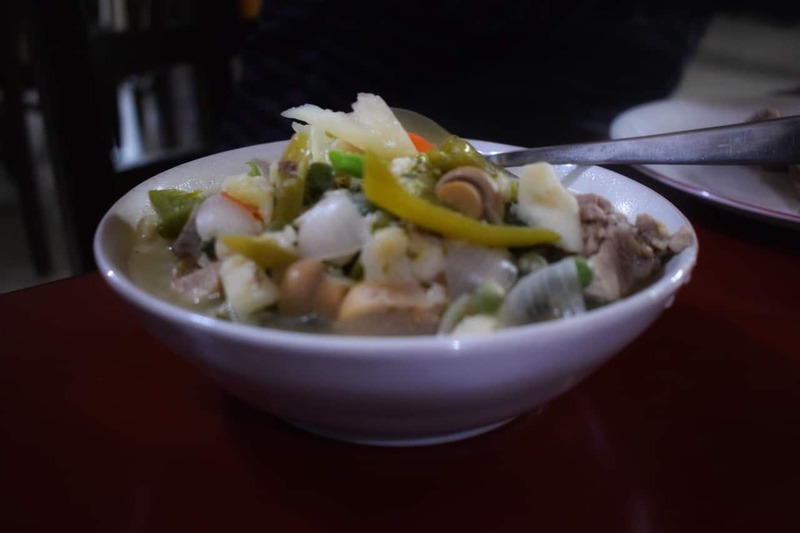 The exotic cuisine of Arunachal Pradesh: also, can a vegan survive? I have heard plenty of complaints from people traveling in India’s far east. The fact that you are unable to find good vegetarian meal, in my opinion, seemed exaggerated. 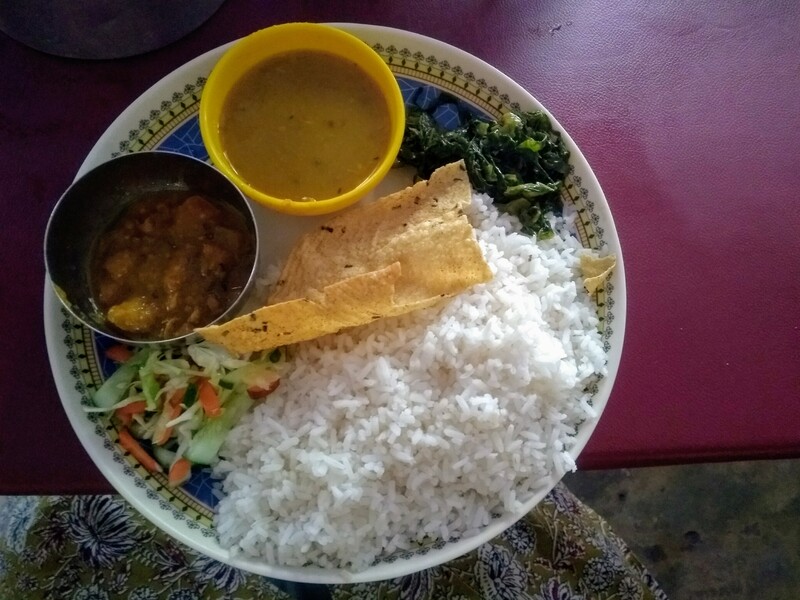 The roadside Dhabas often serve simple Daal Chawal (rice with lentil soup). To add to that, a piece of baked papad and may be a spoonful of leafy vegetables grown at the backyard! I tasted heaven, I tell you. You will see plenty of villages as you ascend on the road, dotted with tiny houses, decked up with plenty of colorful flower pots, growing vegetables in the courtyard, making room for the domesticated yaks, or other bovines, drying golden corns. A simple thali enroute Dirang from Bhalukpong. It serves rice, Salad, Rajma, Daal, Radish shaak (leafy vegetables fried), baked Papad. The dhaba also had choice of country chicken, which I skipped! It was absolutely delicious meal, I tell you. Butter, milk, cheese are used in abundance in Arunachalee meals. As a vegan, you may have to rely on the fresh produce from the orchards. I found plenty of green apples, oranges and kiwi being sold at a very reasonable price. Fermented cheese are in use for different food preparation. They are used with milk and chicken and made into white gravies, served with red rice! If you ask, your host may know where to find the best mushroom from the mountains and cook it al dente! Yak meat or meat from Mithun is procured and eaten in households. I learnt if you are lucky you shall make a stop at a roadside dhaba that serves the local delicacy. Our driver probably though with will be happier with Rice, Daal and radish shak fried. In Bomdila, I spotted a lady selling the beautiful collection of local specialty. Most of the stuff, be it meat, mushroom, dairy products or fruits, are dried for a longer shelf live. 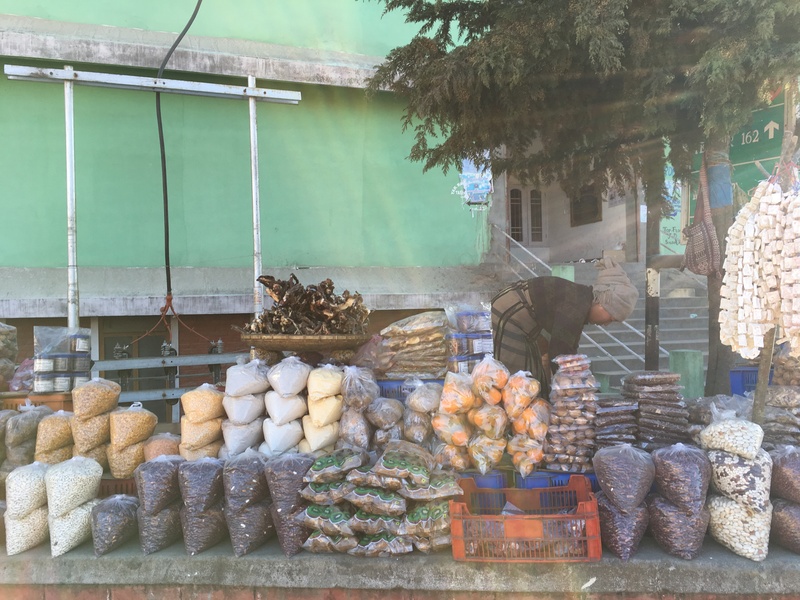 A lady selling local specialty, from dried yak cheese, yak jerky to kiwi, oranges, beef bones and everything! If you love momo, you have reached the right place. Almost every restaurant serves the delicate dumpling, steamed to perfection, often cooked with a dash of spices to cater to your outsider palate! I found food mostly bland, cooked with dollops of butter. If you opt for rice, you will be greeted with thali system inspired by adjacent Assam state. The local moonshine, Apong is pretty heady and should be consumed with caution. I remember the night where I sat by the dainty garden at Dirang and the housekeeper was telling me how difficult it may be to proceed towards Sela Pass when it snows. She went on telling a few servings of Apong, the rice beer, however will make us cut the drama short and make the SUV fly, fly real high! I doubt about an SUV being flown however, I liked my Apong served single time! Chicken Kameng. A Dirang specility where chicken is cooked with fermented cheese, bambooshoots and plenty of vegetables. The aroma of butter coming from it remains as one of my fondest memory! Alcohol sans many of the taxes is pretty cheap in the stores(only for the state of Arunachal Pradesh). Stock up if you like to sip on wine. To explore Arunachal, by helicopter or by car? Dusty roads where construction never ends. Volumes of bricks are piled up by the side. Stone chips everywhere. The band of workers keep on working till sundown. Occasional snow that can make a vehicle slid. This is how I would picture the Arunachal roads. Take an SUV wherever you go. Even the shared vehicles climbing the higher altitudes are SUV and does their job real well. Also read about the old Malla terracotta temples of Bishnupur, West Bengal! Reach Guwahati airport which is being revamped since time immemorial! It is a small airport with few options of food. However you can arrange for taxi and plan a visit to Shillong, Majuli, Nagaland in addition to Arunachal Pradesh. 1. You miss on the road trip with plenty of rivers, mountain peaks, yaks, rope bridges, local villages, and that sorts of fun! An SUV will charge you around 5k INR for a day and run on private commands. If you are opting for a shared transport, prices will go down significantly. INR 500 or so for a SUMO on a daily basis. Is self driving a good idea? 1. Google maps will fail, more often than you can predict. Know the routes like your own palms. 2. If weather conditions go worse, a car can at least be a home for a night. I have heard friends getting stuck en route Sela Pass due to heavy snow fall! The land has housed plenty of tribes (50 or more), who have shared distinct culture with slight influence from the neighbours of Bhutan, nagaland and Myanmar. The Monpa tribes are majority while Adis, Nishis and Apatanis are also known to the extended world. Mainly, their habitat lies on the touristy trails meaning a close contact with the mainlanders! I learnt some of them exclaiming how traveling industry has made them seen how the mainland Indians look like, otherwise flashing the smile through bollywood. Many tribes reside in places where roads have not reached yet. Secure a home stay, pick up a local word or two. Get a tattoo done, Monpa style, or those nose pins like the gorgeous Apatani ladies. Acclimatize… acclimatize… acclamation… I cannot stress enough on this ladies and gentleman. 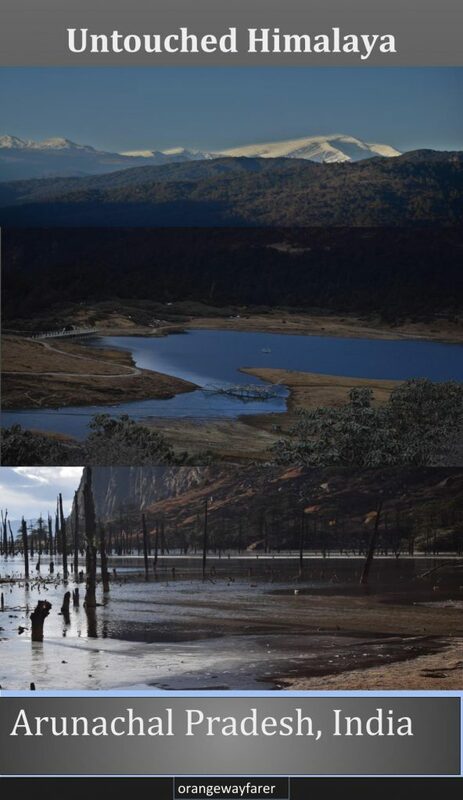 For people like us, staying in the safe haven of Nilgiris that brings pouring monsoon and flourishing agro economy, the high altitude of Arunachal Pradesh can be grueling. Common symptoms are asthma attacks, stomach ache, low pressure etc. Population is sparse, so are the medical facilities. Posing in front of Madhuri lake in an Assamese Muga silk! Just because Madhuri danced, Madhurima has to! I remember the night I came back from Bum La Pass, I was suffering from constant headache and loss of appetite. Stay healthy, choose a hotel with a heater (I do not mean centrally heated, good luck with finding one though!). I think regular shower is another thing which will help you in the brutalist cold. The recent show down at Doklam area has rendered the place swarming with army tanks. there was a time when our car was the only civilian vehicle seen amid an endless army convoy! Without a doubt, it is to be accepted that the presence of army has helped grow tourism industry manifold. The roads, the viewing points and a confidence of safety(!). I remember walking towards the China border at Bum La Maitreestall( a border called friendship place where fist fights can occur at best), and people shouting don’t go, “Gulli mar dega!” (they will shoot you)! An army man reassures, he is there, nothing will happen! A mountain from the Chinese part of Himalayas. What do they call Himalaya there? You know? Also read: The pretty Himalayan hill town of Darjeeling. Nothing will happen as long as he stands there, no matter to what extent our governments fail to establish by friendly bilatteral politics! But that discussion may wait! Once you have stopped being overwhelmed with army, and looking for more practical aspects of life, you will find ATMs are sparse too! Once you spot one, try and withdraw as much as you can. Thank State bank of India later. 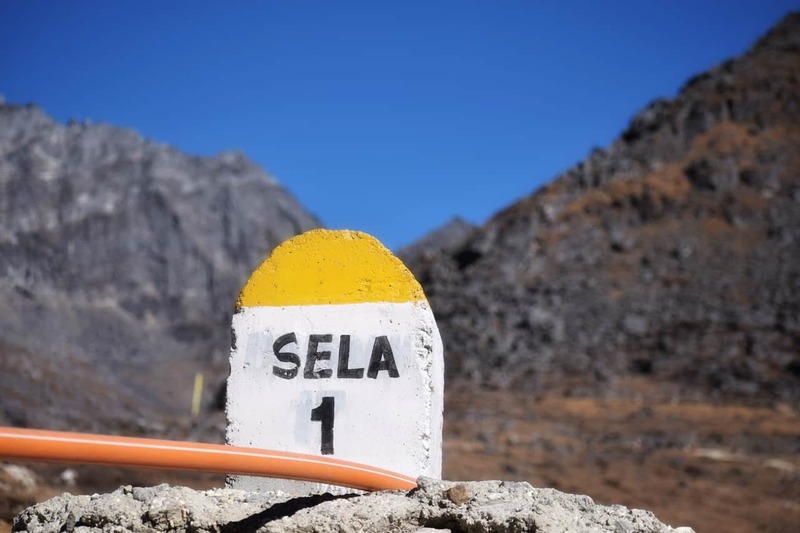 They operate in the high altitude of Tawang as well! The movies that you should watch! The Jang water fall, also known as Nuranang. You can find the beauty in my Youtube channel. 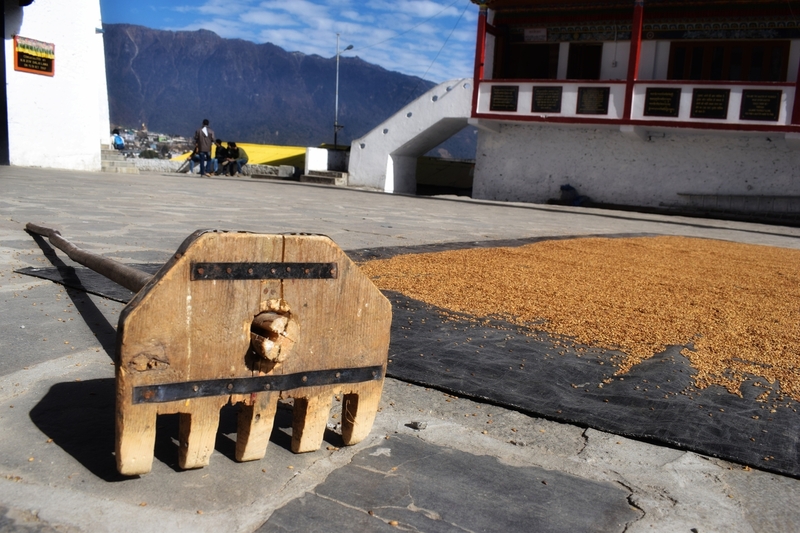 You must not miss this lesser knwon destination while exploring Arunachal Pradesh. I will share a complete list of books I read before I started exploring north east. However, for the time being, you may start with these. lets stay connected in Facebook, Instagram, Twitter! Loved the post? Pin it! The beautify of Pristine Himalaya! Jang waterfall, also known as Nuranang, where SRK danced with Madhuri in the Bollywood film Koyla. A glacier lake in eastern range of Himalayas! The lakes in Bumla Pass. Best of Arunachal Pradesh, India! Want to book a stay in Arunachal Pradesh? This post may contains affiliate links. Please read the disclosure post. If you have liked the article, you may support it by buying using these links without any extra cost to you. Travel stories by an Iraqi Female traveler: Iraq what you have seldom heard off! Arunachal Pradesh looks beautiful! Thanks for sharing all of this practical information on how to visit. Really great tips! I’ve wanted to go to India for a long time and there is so much to see… just added another destination to the list! Hahaha. Simply wonderful! What a great start in the first paragraph, so melodious language like : ‘Life deserves occasional surprises to fight the routine’; or ‘…rivers like Jia Bharali flirt’…. ;the first paragraph is my most favourite. It is very informative – route, IPL procedure, food, staying….all explained in very detail…it reminds me of the style in Lonely Planet or TOI to some extent. Unlike mine, which are generally travelogue, this is a travel blog. Reading the entry requirement, I think as a foreigner, I can remove Arunachal from my bucket-list…I will not get the PAP even if I can get an entry permit. Photography is great, some are stunning. I am generally a fusspot about the quality of an image, but some I love it. 1) In the second paragraph….’Wildlife thrives in unknown valleys, ice cold “steams”, glaciers’; should it be ‘streams’? 2) Under the IPL procedure section, ‘This will require you “the” fill up the necessary information starting from your DOB to your Grandpa’s DOB (just kidding)’; Not sure if it is typo, could be your style; however, my preference would be ‘This will require you ‘to’ fill up’; but I leave it to your discretion. Last but not the least, I was looking for a video clip of Madhurima dancing wearing the Muga silk like Madhuri as the caption said….couldn’t find it….just kidding. I am overwhelmed with such detailed feedback. To be compared with Lonely Planet or TOI is a huge compliment and surely makes my day. These are the words that makes me keep going after a tiring 12 hour work schedule! Photography credit largely goes to Sayantan. However, he is too shy to admit it. These typoes create mayhem for me 🙁 Taking care of it now, like right now. The video clip is coming in Bumla vlog 🙂 stay tuned.